This week's biggest new song was probably "Look What You Made Me Do," the first offering from Taylor Swift's new album, Reputation. But it was far from the week's best song (it didn't get close to our Top 8). It was also a far cry from "Shake It Off," the now iconic first single from her last album, 1989. Of course, some indie rock purists bemoaned that we even posted about Swift's new album and song, despite 90% of our coverage probably being in the indie rock realm. Still, a good pop song is a good pop song and we're happy to recognize one as such, but "Look What You Made Me Do" isn't even a good pop song. Now onto the actual Songs of the Week. 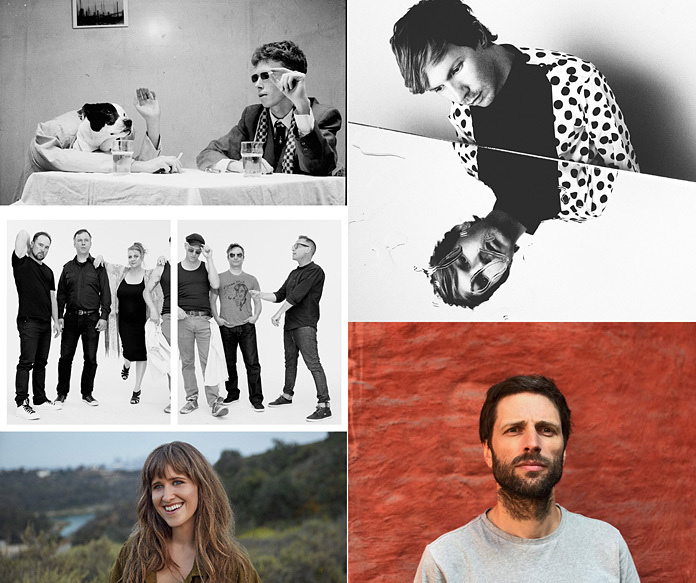 To help you sort through the multitude of fresh songs released in the last seven days, we have picked the eight best this week had to offer, along with highlighting other notable new tracks shared this week. Check out the full list below. 1. King Krule: "Czech One"
King Krule (aka British musician Archy Marshall) shared a new song this week, the jazzy "Czech One," via its video. The minimalist track simply exudes pure cool, with Marshall's unmistakable vocals drifting over a chill beat with some horns in the background. Frank Lebon directed the surreal "Czech One" video, which starts with Marshall walking down a street before he starts floating upwards. Then for most of the video he is on a red-eye flight, with a bandage over one eye, but at moments when you think he's in the air, he's really on the ground. "Czech One" will be the A-side of a limited edition 7-inch due out September 13 via True Panther/XL. There's no word yet on his new album, the follow-up to 2013's 6 Feet Beneath the Moon (released under the King Krule name) and 2015's A New Place 2 Drown (a collaborative project between Marshall and his brother Jack, released simply under the name Archy Marshall). But if this is the first single to the new album, then it's a good omen. This week he also announced some tour dates for this fall, which you can check out here. This week Beck shared a lyric video for a widescreen sounding new song, "Dear Life." Jimmy Turrell, Laura Gorun, and Brook Linder all directed the colorful "Dear Life" lyric video, which features animation by Drew Tyndell and Rhiannon Tyndell. This week he also confirmed the release date, cover art, and tracklist for his new album, Colors. Colors is due out October 13 via Capitol. "Dear Life," like Colors' previous two singles "Wow" and "Dreams," is definitely from the fun, upbeat, and pop side of Beck's work (à la Odelay or Midnight Vultures, instead of the more stripped down singer/songwriter fare found on Sea Change and Mourning Sound). Greg Kurstin and Beck produced Colors, with the exception of "Wow," which was produced by Beck and Cole M.G.N., and "Fix Me," which was produced by Beck. Serban Ghenea mixed the album, except for "Dreams" and "Up All Night," which were mixed by Greg Kurstin and Beck. In June 2016 Beck released a brand new song, "Wow," and announced plans to release an as yet to be titled new album sometime via Capitol (it was originally due out last October, but was pushed back to a TBA date). In an interview with Rolling Stone earlier this month Beck announced the album's title and release month. "I suppose the record could have come out a year or two ago," Beck said to Rolling Stone's Andy Greene. "But these are complex songs all trying to do two or three things at once. It's not retro and not modern. To get everything to sit together so it doesn't sound like a huge mess was quite an undertaking." "Wow" followed "Dreams," a standalone single that was released in 2015, and "Wow" matches that track's poppy vibe, sounding more like something from his great 1999 album Midnight Vultures rather than his last album, 2014's more subdued Morning Phase, which won the Grammy for Album of the Year. "Dreams" is featured on Colors but in a new mix. Montreal indie-pop heroes Stars are releasing a new album, There Is No Love In Fluorescent Light, on October 13 via Last Gang. This week they shared another song from it, "Real Thing." It's a fantastically produced ear-wormy electro-pop gem featuring the lead vocals of the band's Amy Millan. This week the band also confirmed the album's tracklist and cover art, as well as some tour dates, and all of that is here. 4. Ivanka Del Rey (aka Amber Coffman): "My Father"
On Thursday former Dirty Projectors singer/guitarist Amber Coffman shared a new anti-President Donald Trump song. It is sung from the perspective of his daughter, Ivanka Trump, cutting together her real words from interviews with her (as per the song's video). But in an amusing twist, Coffman has very effectively mimicked the vocal stylings of Lana Del Rey for the song. It's entitled "My Father" and is credited to Ivanka Del Rey. The video was produced by Super Deluxe. Watch it below. Coffman released her debut solo album, City of No Reply, back in June via Columbia. She has previously shared a video for "All to Myself," the audio for "No Coffee" (and a video for the song), the audio for "Nobody Knows," and offered a statement as to why she left Dirty Projectors. Norwegian space disco mastermind Lindstrøm (aka Hans-Peter Lindstrøm) announced a new album this week, It's Alright Between Us As It Is, and shared its first single, "Shinin," featuring Grace Hall. It's Alright Between Us As It Is is his fifth album and is due out October 20th via Smalltown Supersound. The album also features Jenny Hval and Frida Sundemo. Lost Horizons is a new duo featuring former Cocteau Twins member (and Bella Union label head) Simon Raymonde and drummer Richie Thomas (who has played with The Jesus and Mary Chain, Felt, and Cocteau Twins). Their debut album, Ojalá, is due out November 3 via Bella Union. Previously Lost Horizons shared "The Places We've Been" (which features guest vocals from Karen Peris of The Innocence Mission) and "Frenzy, Fear" (which features Hilang Child, aka singer/songwriter Ed Riman, a half-Welsh, half-Indonesian Londoner). This week they shared another song from the album, "She Led Me Away," which features the unmistakable vocals of former Midlake vocalist Tim Smith. Although Midlake has continued on without Smith and has released some fine music since he left the band in 2012, it certainly is nice to hear Smith's remarkable vocals again. Raymonde had this to say about the song in a press release: "This track started as an improvised bass, drums and piano tune and thanks to Will Stratton ended up as an acoustic guitar track. That was partly to do with Tim's vocals, because when I realized that he really WAS going to sing on it, I wanted to be sure the music didn't get in the way too much. After all, a 'Tim Smith' vocal in any shape or form these days is as rare as a sighting of the Siberian dusky thrush. It's no secret that his perfectionism has meant that his recorded output has slowed to a snail's pace, to be honest, even slower than that, so I didn't have massively high hopes when I sent him the song and asked if he'd like to sing on it. All the more wonderful that he wrote and recorded the vocals within just a couple of weeks! I can't say he didn't have doubts about his performance, that prefaced the arrival of each demo track but I responded so enthusiastically, this seemed to have done the trick. It's brilliant to have Tim Smith back making music and what I will add, is that the progress on his own HARP record is significant, after a recent trip to my home town of Brighton, and hopefully we can enjoy even more of those sad, melancholy tones before too long." Ojalá is filled with guest vocalists, including Sharon Van Etten, Marissa Nadler, Horse Thief's Cameron Neal, Liela Moss of The Duke Spirit, Beth Cannon, Gemma Dunleavy, and Phil McDonnell. 7. Cults: "I Took Your Picture"
Cults (the duo of Madeline Follin and Brian Oblivion) are releasing a new album, Offering, on October 6 via Sinderlyn. Previously they shared its title track (also its opening track), which was one of our Songs of the Week. This week they shared the album's second single, "I Took Your Picture." Offering is the band's third album and it comes four years after 2013's sophomore release, Static. In that time Madeline Follin teamed up with her brother, Richie Follin of Guards (and Willowz) to form a new band appropriately named Follin. Cults consciously decided to take a break, as Oblivion explained in a previous press release: "I feel like we stepped into a tour van when we were 21, and basically didn't get out of it for the next few years. We wanted to give ourselves some space to have normal lives, and wait until there was something new to say." Follin added: "It was exciting, because writing stopped feeling like a homework assignment. I was able to sit down and do it only when I wanted to. These songs are less art projects, less thinking 'this is a heartbreak song, what would Lesley Gore do?' and more reflective of things that have happened in our own lives." Chelsea Wolfe is releasing a new album, Hiss Spun, on September 22 via Sargent House. Previously she shared the album's the dark and oppressive "16 Psyche" (as well as a video for the song) and the equally dramatic black metal (or doom metal) sounding "Vex." This week she shared another song from the album, "Offering." It is a bit more chill and atmospheric than the album's first two singles and might be the best of the three singles. Kurt Ballou (Converge) recorded the album, which features guitar contributions by Troy Van Leeuwen (Queens of the Stone Age, Failure) on the whole album. The album is the follow-up to 2015's Abyss. A previous press release says the album "was conceived as an emotional purge, a means of coming to terms with the tumult of the outside world by exploring the complexities of one's inner unrest." Wolfe had this to say about the album in the previous press release: "I'm at odds with myself. I got tired of trying to disappear. The record became very personal in that way. I wanted to open up more, but also create my own reality." Read our 2015 The End interview with Wolfe about endings and death. alt-J: "Deadcrush (Lea Porcelain Remix)" and "Deadcrush (Ben de Vries Remix)"
John Carpenter: "In the Mouth of Madness"
Doe Paoro: "Fading Into Black"
Floating Action: "Last of the Wild Cards"
Ride: "Cali (Luke Abbott Remix)"
Taylor Swift: "Look What You Made Me Do"